If you’re travelling with kids this Summer, make sure to head on over to Swissport’s Aspire lounge in Manchester Airport Terminal 1, which has been kitted out with the world’s first play-tech pods for young children. Courtesy of a relationship with the children’s character Airside Andy, this innovative new collaboration, designed to keep children entertained during airside waiting times, sees the introduction of child friendly tablets, preloaded with Airside Andy fun and adventure along with other mainstream games. Housed in a child friendly baggage carousel, the tablets protrude from real suitcases on bendy poles creating a unique and fun play area for children. Swissport has opened its lounge doors to Airside Andy in recognition of the need to create a space for children that acknowledges and caters for how children’s play has changed and developed. Together they plan to roll-out the pods in all airport lounges nationwide. 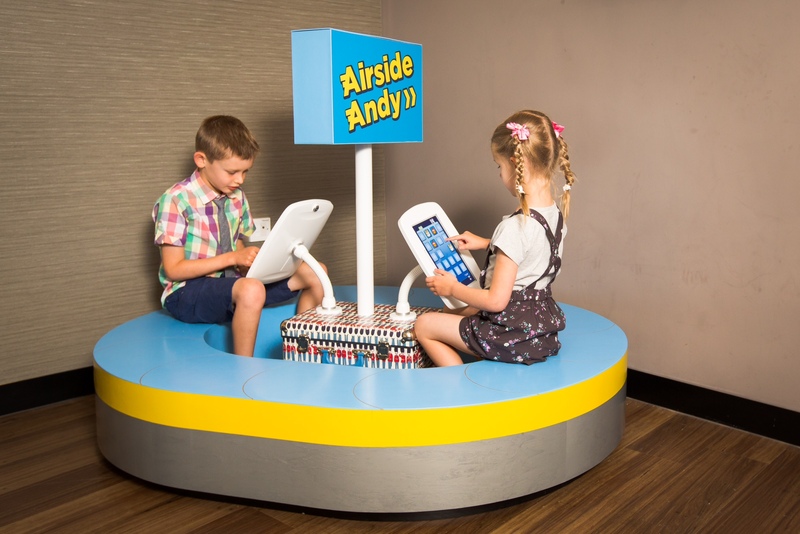 Airside Andy gaming pods come fully equipped with 2 – 4 interactive tablets, child-proofed and fully loaded with Airside Andy’s latest pilot and a host of games. Airside Andy is a brand new multi-platform preschool series that follows a lively team of ground-based airport vehicles and their enthusiastic leader Andy. Featuring CGI animation plus digital gaming apps and ebooks, Airside Andy is an action-packed dash behind-the-scenes at the airport or airside, revealing the secret world and celebrating the characters who work together to keep the passengers moving and the planes in the air. Andy, the Controller of the Airport, is living out his childhood dream, helped by his trusty sidekick Tilly and a team of busy little vehicles including Trunk the tow truck, Cyclone the ground control vehicle and Stella the motorised steps. Together they ensure that every day at the airport runs smoothly. The brand has an educational foundation firmly rooted in the STEM curriculum – Science, Technology, Engineering and Mathematics. In particular the airport presents a context to promote early mathematical concepts like being behind or ahead of time, sequences, measuring and force. "the wonderment of the airport...a secret mechanical world of discovery"